We are bracing ourselves for the final season of Game of Thrones if only because we know that some of our favorite characters will likely (read: for sure) die. What we weren’t prepared for on this most casual of Thursdays was reading two GoT theories that predict Sansa and Arya will die in season eight. Worse still, these theories are pretty damn convincing. Ack! Say it ain’t so! Before any tears are shed, let’s take a closer look at what these theories posit. As reported by Cosmopolitan, the first fan theory that predicts Sansa and Arya will die young comes from an early teaser trailer that focuses on Jon Snow, Sansa and Arya going down into the crypts underneath Winterfell. We watch as the Stark children pass the statues of their dead parents, Lyanna Stark (Jon’s mother) as well as Ned and Catelyn Stark (Sansa and Arya’s parents). The three Starks come to the end of a crypt hallway and see their own statues, looking on them in fear. Now, here’s where the ominous foreshadowing comes in. 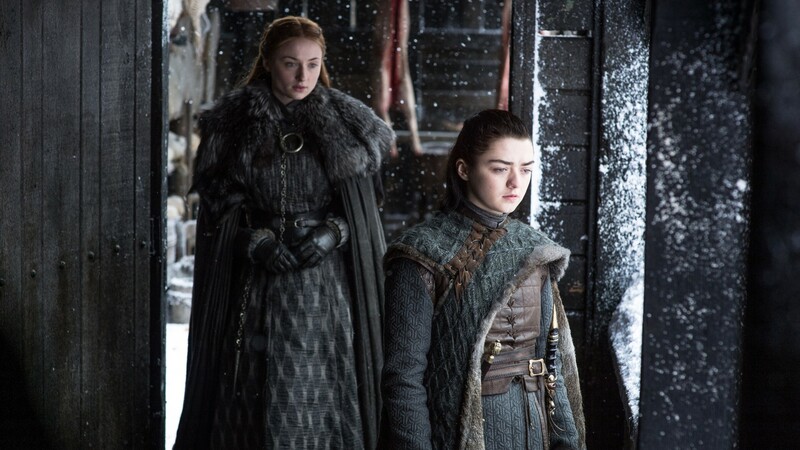 As the camera cuts to show the statues, you can see that the Sansa and Arya statues look young, as if molded to show the girls at the age when they died (which would make sense since other statues are carved to mimic the person as they looked at the age they passed). Jon’s statue, however, arguably looks a bit older, as if predicting he will die in middle age. This line is almost an exact echo of what Ned Stark said to Robert Baratheon in the first episode of season one, when Robert and his family arrived in the North. In that scene (which you can watch below), Ned is heard telling Robert, “Winterfell is yours.” Fans believe that since Ned died later in season one after being accused of treason against Robert, Sansa might possibly be accused of something similar towards Daenerys and end up losing her head because of it, with her initial welcoming words acting as a kind of sad foreshadowing to her fate. With less than a month left until GoT returns for a final season on April 14, only time will tell if these theories prove to be true.